In Memoriam: Tom Ulrich, acclaimed wildlife photographer and dear friend to many in the PCAS, passed away on Feb. 10 2017 due to complications from a rare cancer with which he was diagnosed in January. Godspeed, Tom. Thank you for so many wonderful memories here in Stillwater. Northern Parula 3 3 foraging more or less together through a few canopy trees near the creek – just happened to have caught this little group together. Dark-eyed Junco (Pink-sided) 1 Rufous-tan flanks, brown back, and noticeably darker gray mask around eyes and bill. Bunting Hunting, July 15–18 2016! Mid-summer can be a tough time to go birding as many breeding birds have fallen silent and the fall migrants haven’t really started streaming through yet. But one group of colorful songsters is still out there singing through the hottest days: buntings! This weekend, we invite you to join us in Bunting Hunting 2016! You know you love these guys: Lazuli, Indigo, Varied, Painted. Now go out this weekend and aim to find them in as many different places as you can. Once you’ve found them, simply enter your checklists – or just your incidental observations – to eBird. That’s it! The point is just to spend some time generating some great data on the distribution and abundance of the genus Passerina! Botanic Garden at OSU – 16 Jan. 2016. Seventeen well-bundled participants enjoyed a nice walk around the Botanic Garden at OSU today. Highlights of the 37 species found included nice looks at Yellow-bellied Sapsucker, Brown Creeper, and Golden-crowned Kinglet. We were treated to a flyover Bald Eagle shortly before the north wind got the better of just about everyone! Payne County Audubon Society made another Labor Day visit to Black Mesa in Cimarron County again this year. Participants on this trip were John Couch, Les Imboden, Brandy and John Polo, and Samantha and Josh Jones. John C. and Les got out to the state park on Friday afternoon and started the weekend off with nice birds like Bullock’s Oriole and a Golden Eagle. The weather in that part of the state has been wet this summer and so the normally arid area was very green for September. This productivity translated to a lot of insects and thus, well-fed birds. Lake Carl Etling, located in the park, continues to keep a decent water level, meaning there were quite a few mosquitoes at time, but given the number of flycatchers, Eastern Phoebe, Eastern and Western Wood-Pewees, Vermilion Flycatchers and other songbirds, the numbers were under control. Les and John C. had 2 camp sites to accommodate everyone and the site the 4 late-comers stayed at hand two large cottonwoods side-by-side, supporting a large limb that had died and broken and been caught in the crotch of the tree next to it. This will come into play further on in the account. The group hit the road late in the day on Saturday and found a few Horned Larks and Lark Sparrows to start. While driving around to find an Osprey for Les, we came across a few Buteos, one of which we didn’t identify, but appeared to be a Ferruginous Hawk. All the while, American Kestrels were deftly winging through the air at every turn. We headed into the country north of the state park and close to the Colorado border. A covey of Scaled Quail, a life bird for Brandy, brought the truck to a stop and we jumped out to look around. John P. heard the whispy notes of a Cedar Waxwing and started checking all the tops of the junipers. In a dead juniper about 80 feet off the road, we found 2 adult waxwings and then a few moments later, an immature bird flew in to join them. This immature bird indicated that the pair had apparently bred in the area, an area well south of the “normal” breeding range of the species. We made it into Colorado and Les took the group to Picture Canyon, a U.S. Forest Service location with petroglyphs, where we had a Canyon Towhee and Canyon Wren. At the end of the jaunt, the group headed to a valley that is just north of the scenic overlook on the north side of the lake. This valley in the last few years has proved a reliable place for hearing Common Poorwills at dusk. Unfortunately, the wind didn’t cooperate. The next morning, Les fixed the crew a great breakfast, and coffee!, and after that meal, we headed off to Easter Pageant, a spot known for Black-throated Sparrows, Western Scrub-jay, a bird that John Couch wanted to find, and Juniper Titmouse. Unfortunately, there were neither of these. There were however Sage, calling!, and Curve-billed Thrasher and a Ladder-backed Woodpecker. And one of several Greater Roadrunners that were seen throughout the weekend. Our goal from there was Carrizo Creek, Colorado, to look for Lewis’s Woodpecker. While trying to find the right road, using 3 different maps, a compass, and the wits of 4 people who had visited the area before, we stumbled across the tri-state marker for Oklahoma, Colorado, and New Mexico. Brandy and I tried to find this marker the first couple of times we were out there and were never able to locate it. Eventually, we got our road and along the way to Carrizo, we were passing through U.S. Forest Service allotments. I spotted a large playa and Les stopped the truck. Upon hearing about me exclaim about the playa, John C. stated, “we should trespass”, probably the quote of the trip, for those familiar with John Couch’s rich birding history. Please note, P.C.A.S. does not actively encourage participants to trespass. A few of us *ahem* accessed the land adjacent to the playa to get a better look at what was in the water: White-faced Ibis (1), Greater White-fronted Goose (4), Northern Shoveler (>6), Blue-winged Teal (@20), Northern Pintail (1), Killdeer (1), and Wilson’s Phalarope (2). After the stop, we continued on our way to Carrizo Creek. At the official site for Carrizo, it was pretty quiet. We stopped at two more pull-offs along the creek to look for the Lewis’s Woodpecker, but had no luck. We did find Western Scrub-jay and an apple tree which took care of the group’s hankering for a snack. We wend our way back through Colorado to the state park. After a break, the group walked the park with Bill Carrell of Tulsa and found another Canyon Wren along with Western Wood-Pewee and Vermilion Flycatcher. As the afternoon started to get late, 6 or 7 Common Nighthawks were weaving through the sky. Samantha noted movement in a tree and we came across a Yellow-billed Cuckoo. After dinner, we tried again for Common Poorwill in the north valley, but the wind again worked against us. We played recordings of Western Screech-owl, but had no luck with that species either. On our last morning, we packed our gear before doing any birding. I had moved my car from where it had stayed parked under one of the big cottonwoods the night before, because I wanted it closer, as there was a possibility of bad weather. The wind had definitely picked up and if a lot of rain and wind materialized we may have needed to make a run for the car. To get their packing moving quicker, Josh moved his car in the morning up to his tent. And good thing he did. Ten minutes after he moved his car, a large section of a dead branch fell onto the place where both of our cars had been parked. The strong winds from the previous night might have done something to loosen the piece from where it was laying. After getting packed, we walked the short nature trail in the park. The most notable wildlife there was a rattlesnake that crossed the path a couple of minutes after John C. and Les had walked through. We had run into John Sterling, another Oklahoma birding fixture, the night before and he had talked about Regnier Ranch. The ranch had previously welcomed birders, but then a new generation of the family did not extend the same hospitality. The road into the ranch is public and offers the chance for interesting birds. John Couch said that in decades past, Prairie Falcon and Golden Eagle had nested there. Upon the “discovery” of this “new” location, our group drove out to the road and cruised slowly to look for more birds. This ended up yielding Black-billed Magpies calling from the far side of the canyon, but not much more. Saturday, Apr. 4: 8:00 am. Please join us for a lovely morning along Stillwater Creek at Babcock Park, 19th and Western. John Polo will lead a walk focusing on spring migrants. Come get your FOY on! We’ll visit the Brown Ranch, a working ranch in central Payne County. Trip leaders will be Caitlin Brown and Les Imboden. People who plan to attend should meet at the Boomer Lake dock at 8am. Caitlin will be there to lead the attendees to her family’s ranch and she and Les will lead the group. The morning may be cool, but the weather should be fine for the day. Dress appropriately and bring water; there are no facilities at this location. *Reminder that beginning 2014, all field trip participants will be required to sign a liability waiver to join us in the field. This is a new condition of our insurance policy. Field trip leaders will have the forms on hand at the meeting location. Les Imboden’s Pecan Valley boasts 40 acres of Oklahoma habitats, most of it open grass and shrubland with a welcoming pecan grove. Les claims to have Bobwhite on the property and it looks like it would be a suitable habitat, but so far, he has yet to produce a single bird for any of his guests. Regardless of that, it’s always a fun time when he and Susie Taylor host Payne County Audubon Society and the Cimarron Chapter of the Sierra Club for Birding and Burgers. This year, the temperature was quite nice, but there was a little bit of wind that seemed to keep the birds somewhat huddled up and out of view. With a group of 20 or so guests for the event, Les had planned ahead and secured 2 people to lead groups. Instead of the tried and true leadership of Tim O’Connell and John Couch, he relied on newer members to P.C.A.S., Alex “Golden-crowned” James and myself, to lead the groups. Fortunately for the other people in my group, Jim Shaw and Lisa Elizondo were also around to help spot birds. On the first part of our foray north from his place, we looked hard for some birds to get our list started. Upon spotting some L.B.J.s flush from some low vegetation, I got the group to huddle up on the trail and then I back-tracked around where the birds had disappeared and tried to flush them into some shrubs that would give a good view. This ploy half-worked as we were able to spot Harris’s and Field Sparrows, as one or two escaped before being identified. At this point, Fidel Atuo joined our group, giving us an excellent pair of eyes for raptor finds. We continued north and the trail was mostly quiet. We could hear peeps here and there, but hardly found the sources. A Sharp-shinned Hawk buzzed by. Our group pondered an attempt at walking in a line across one of the “quaily”-looking fields, but getting organized never really happened. I spotted a couple of abandoned nests, one that I was quite sure had been a Bell’s Vireo nest, since it had the noticeable vireo character of a cup suspended in a fork and it was placed well inside a small thicket of sand plum, a common practice for Bell’s in the area. Soon after, I heard Harris’s Sparrow calling from a depression that was surrounded by trees. I walked up to the rim and saw several birds scatter. I called the group over and we picked out more sparrow species along with a Carolina Wren. Having wandered off the trail to this depression and not knowing all of Les’ property well, I thought it was a good idea to get back on the trail and find a pond. We bushwacked it back to the south and spotted a redtail low over some trees. While watching it, some of our group noticed a much more distant raptor and after spending a minute checking it out, we were able to identify it as a Bald Eagle. A few moments later, we got to one of Les’ ponds. At first glance, there was nothing on it, but after searching the far end, I spotted our only waterfowl for the trip, a female Hooded Merganser. We also scared up two Killdeer at this pond. As we were leaving the pond, we ran into the other group and Northern Harrier picked this moment to glide over some trees. We made our way further south to the pecan grove to look for the resident Barred Owl. Along the way, we searched a line of redcedars for Long-eared or saw-whet owls, but had no luck. At the grove, Lisa made a good impression of a Barred Owl call, but to no avail. She did spot a Pine Siskin and Yellow-bellied Sapsucker. We left the grove and walked back to the house. The cattails at another pond held more L.B.J.s, but they stayed hidden, making identification impossible. At this point, it was lunch time. As the other group arrived, we exchanged sightings and Les asked each group for a tally. Alex’s group had 36 birds and mine ended with 35 birds. Les and Susie had prizes for the group with the most birds, beautiful Christmas ornaments shaped like birds. The sun was strong and everyone sat around, enjoying the comraderie and food. Birding at Pecan Valley, wrapped up with a good lunch, is a great way to spend a fall day. Migration is ramping up – Tim O’Connell found a Broadwing in the backyard today. May 31: I did a little bit of exploratory birding in the eastern part of Payne County this morning in hopes of finding some rare breeders. I was unable to find any abnormal grass/shrub-land birds in the relatively large area of range land NE of Yale, but a couple spots in this area bear watching for a Sedge Wren or Henslow’s Sparrow if we continue to have good moisture this summer. Specifically, the areas near the intersection of Lakeview and Underwood and also near the intersection of Airport and Eagle appear to be fairly “tall-grassy” with appropriate structure. May 19: They were somewhat few and far between, but there are still some excellent migrant songbirds around the area. The highlight this morning was a singing male CANADA WARBLER at Babcock Park (heard first then seen after some mild bushwhacking on the north side of pond near where the Wood Thrush has been). At Couch Park, I managed to finally stumble on a small wave of warblers near the restrooms that included BLACKBURNIAN WARBLER (female), American Redstart (female), Tennessee Warbler and Blackpoll Warbler. By the north side pine plantation, I was able to pish up a singing male MOURNING WARBLER. May 17: While running errands this morning, I did a quick drive-by for shorebirds around the grassy lawns on the northeast side of town. The big field south of the Armstrong Plant was empty, but a flooded area on the east side of the Asco Plant (old Mercury plant) held 7 species of shorebirds, including Wilson’s Phalarope, Killdeer, and Solitary, Least, Semipalmated, Baird’s, and White-rumped Sandpipers. There was also a Horned Lark here. Given the birdiness of these fields, I decided to detour over to the Meridian Tech fields. Here I found ZERO shorebirds, but perhaps even better, there were 2 LEAST TERNS fishing on the bigger pond. May 14: Among 85 mostly resident species at Lake Carl Blackwell this morning, highlights included 4 BLACK TERNS far out over the lake, 2 late TREE SWALLOWS at Ski Point foraging with the Cliff Swallows, and the return of the PRAIRIE WARBLER to the same area it spent 2014. May 11: What a great morning to be out! I ran into John Polo at Couch Park and we birded there and at Babcock Park. Couch Park was the best I’ve seen, with best bird being a VEERY. Other highlights included male Rose-breasted Grosbeak, Blue-headed Vireo, Pine Siskins, male American Redstart, Wilson’s, Yellow, Yellow-rumped, Orange-crowned, Tennessee and Nashville Warblers and Northern Parula, L. Waterthrush, and Common Yellowthroat; I got a glimpse at and also heard a likely Philadelphia Vireo, but not good enough views/hearings to confidently call this tricky species. Babcock Park was also decent with CHESTNUT-SIDED WARBLER and Blackpoll and Prothonotary Warbler (bringing total to 13 warblers on the morning). The WOOD THRUSH continues at Babcock as well. Also saw 7 or 8 Least Flycatchers across both parks; these guys seem particularly abundant compared to last year. 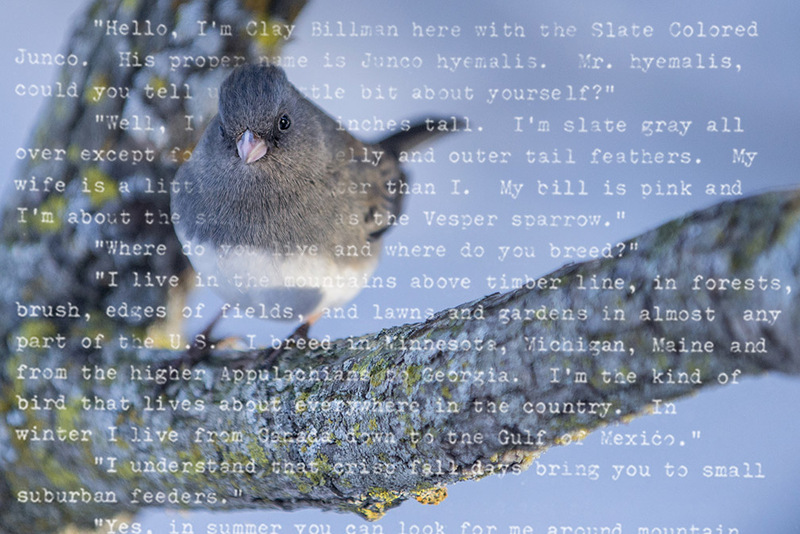 Local photographer and all-around great guy, Clay Billman, wrote to PCAS with a recently rediscovered essay about juncos from his school days. The essay is a great example of the exuberance that children can have for birds and the kind of funny and endearing creativity that can be generated from that exuberance. LEWIS’S WOODPECKER continues at Lake Carl Blackwell in the same grove of trees where it was first noticed on 18 November. 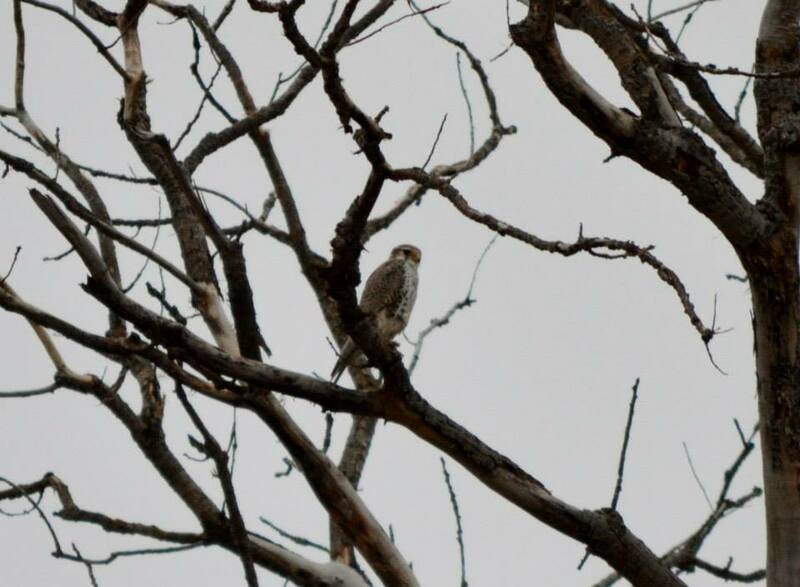 A PRAIRIE FALCON was observed in the same tree at 4:00 pm on Dec. 20. Lewis’s Woodpecker at Lake Carl Blackwell, Dec. 20, 2014. Photo by Lisa Elizondo. Prairie Falcon at Lake Carl Blackwell, 20 Dec. 2014. Photo by Lisa Elizondo. 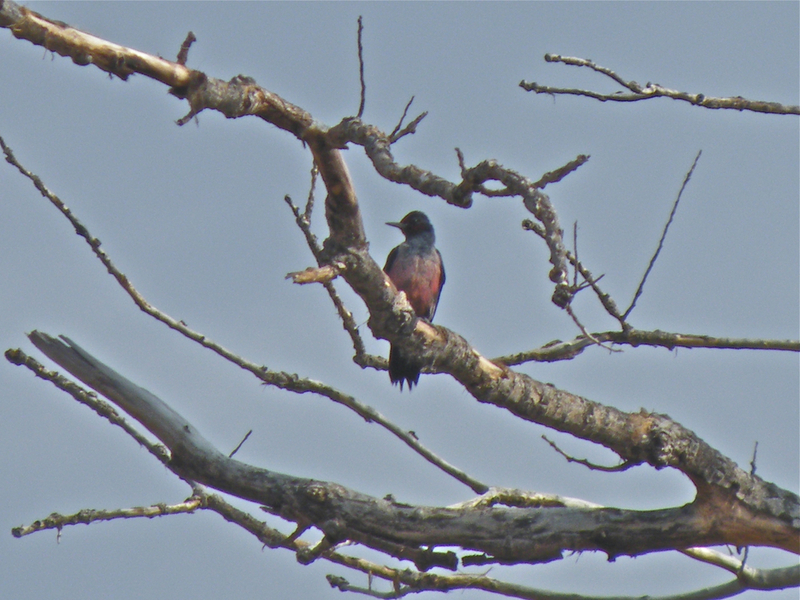 On Nov. 18, a Lewis’s Woodpecker was spotted at Lake Carl Blackwell, and the bird continues at the same spot today (30 Nov.). Lewis’s Woodpecker is a Rocky Mountain bird that is a great find even at the western edge of the Oklahoma Panhandle; this appears to be the first Payne County record. The bird has been hanging around a large dead tree near the marina at Lake Carl Blackwell, across the street (east) of the Lake Store and Headquarters building. John Polo shared his thoughts below on his first opportunity to see this stunning bird. Lewis’s Woodpecker, 11/24/14. Photo by Tim O’Connell. Brandy and I have friends with a 3 y.o. daughter whom we adore. When she was still crawling around, I started calling her The Goose. The name has stuck. Brandy was happy to share my sisters’ nickname for me with The Goose, so now we’re Brandy and JohnJohn when we’re at The Goose’s house. Yesterday, board member Alex James was in a class with Dr. Scott Loss at Lake Carl Blackwell, when Dr. Loss found a Lewis’s Woodpecker. This is at least a county first, if not a first for the whole eastern half of Oklahoma. I had to get out to see this bird to get it on my state list. Since it was found during work hours, I was kind of hamstrung. And we were supposed babysit The Goose for the evening… what better way to get the kiddo hooked on birding! We hurried to get the child and head over to the lake before it got too dark. Dr. Loss gave a good description of the location, but my luck with chasing is always lousy. We drove around the area, hoping for a chance viewing of the bird on the move, but no luck. We parked as close to the area as we could. We were slowly approaching the tree i believe Dr. Loss had described, but before we got close, an elm still cloaked in leaves held the grunts of what I thought was a Red-headed Woodpecker. And it was. However, it revealed the Lewis’s Woodpecker to us as it flew to the Lewis’s newly declared territory and the Lewis’s met the interloper and drove it off. Brandy and I both let out short claims of surprise and then we set The Goose’s attention to the Lewis’s as it looked for a hole to settle into for the evening. The Goose picked up a broken branch and decided that the bird may want to have a stick with it, thus offering it to the bird. We watched the bird for as long as the light allowed, with The Goose quite content with having found the bird for us and leaving the stick for the bird when we departed. We sure did. And I’ll give her all the credit for our successful trip in relocating the bird. Thanks, Goose! Dr. Brandao and his staff did a terrific job in caring for the young owl. Bill snapping and staring as fierce and wild-eyed as she should, the youngster took to the air and flew north over her crowd of fans, and on to freedom. We wish her the best and are grateful to have a resource in Stillwater that can provide such excellent care. That said, please spread the word that the bird’s parents provide even better care than we humans can: leave those baby birds alone. 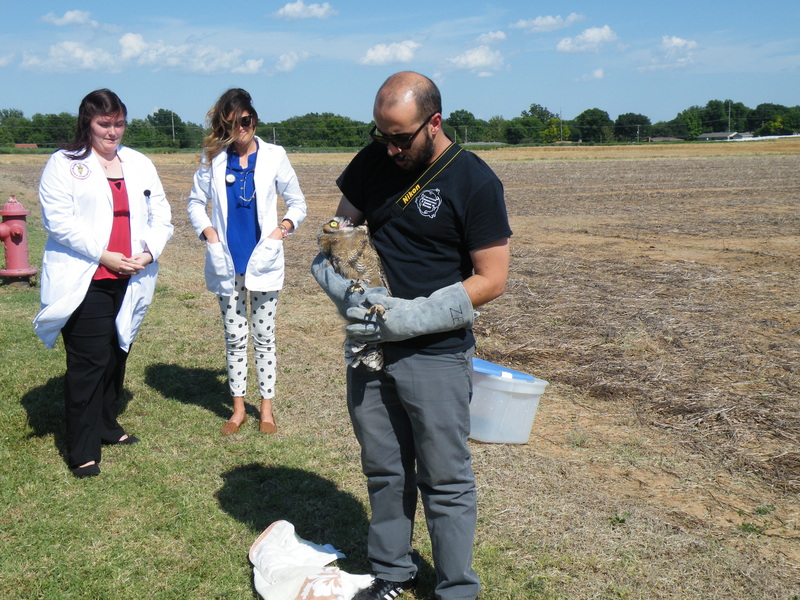 Above: Dr. Joao Brandao prepares to release a young Great Horned Owl with the honorary assistance of one of the benefactors of the Avian, Exotics and Zoological Medicine Ward at OSU’s Veterinary Medical Hospital. Come join us for the celebration and spectacle of a healthy young owl’s return to the wild on Wednesday afternoon, June 10th, 2015! 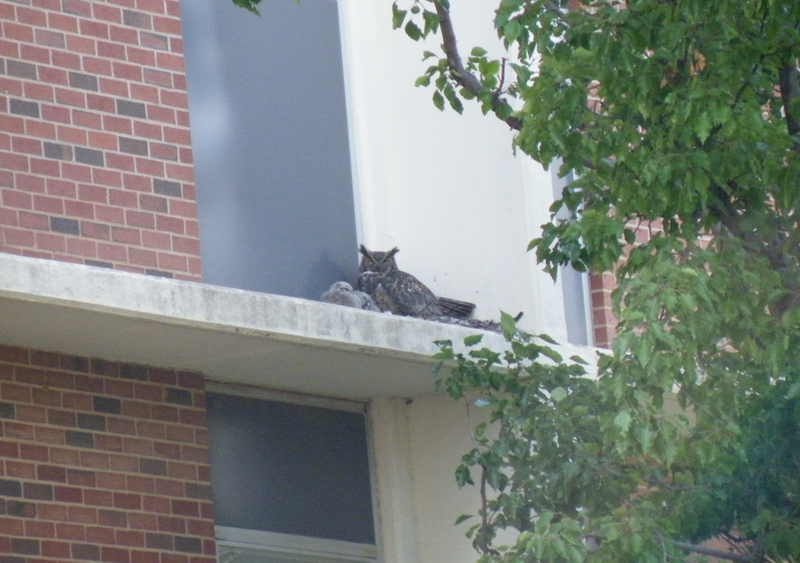 In the spring of 2014, we learned of a Great Horned Owl that had built a nest on a ledge of an academic building on the OSU campus, very near the Library. Both the location (in plain view of hundreds of people every day) and the date (found on eggs in early April – much later than normal) were unusual. 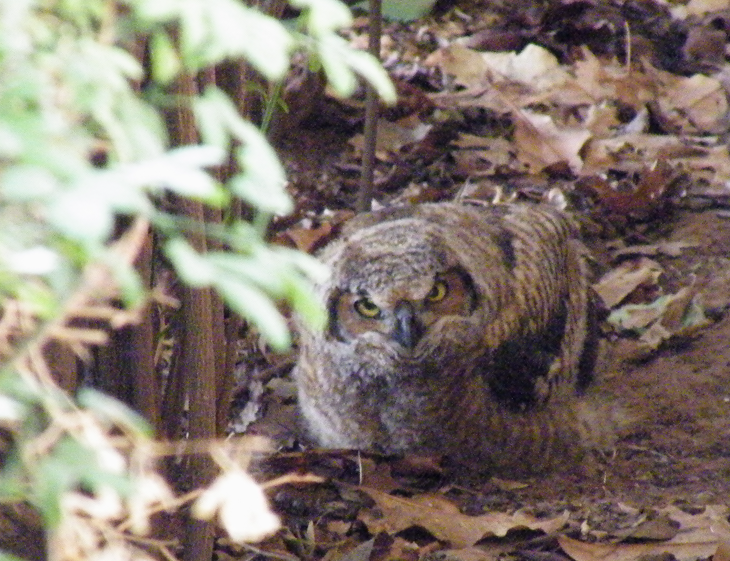 Female Great Horned Owl incubating on 11 April 2014. By May 18, two nestlings were alive and well, and had endured disturbances from nearby construction and thousands of graduates filing past the nest site. Protected by their mother and fed by their father, these two nestling owls were off to a great start on May 18, 2014. 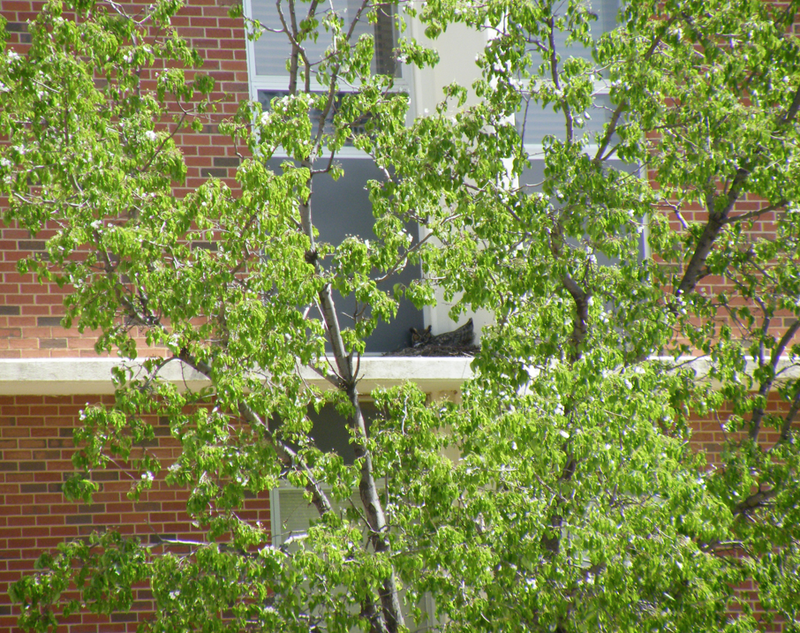 By May 24, the mother no longer perched on the ledge. 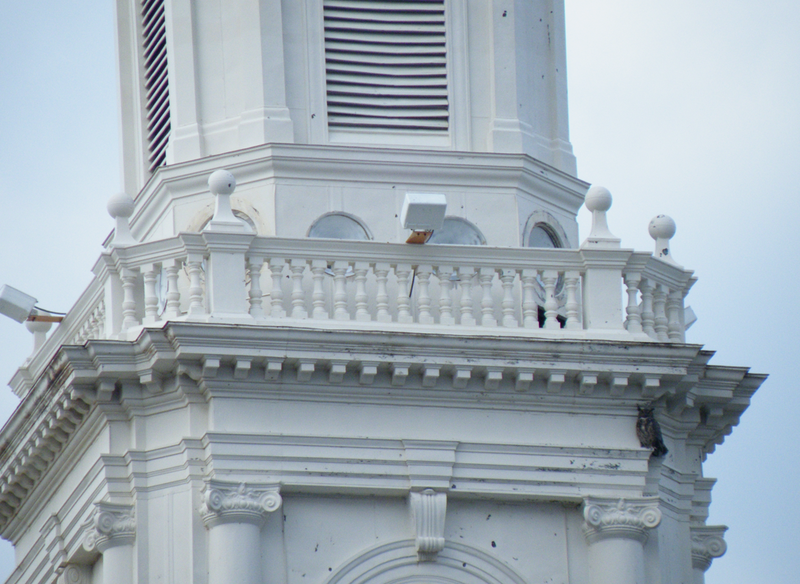 She instead occupied her time by keeping watch from a great vantage point on Edmond Low Library, and assisting the male in gathering food for their ravenous nestlings. 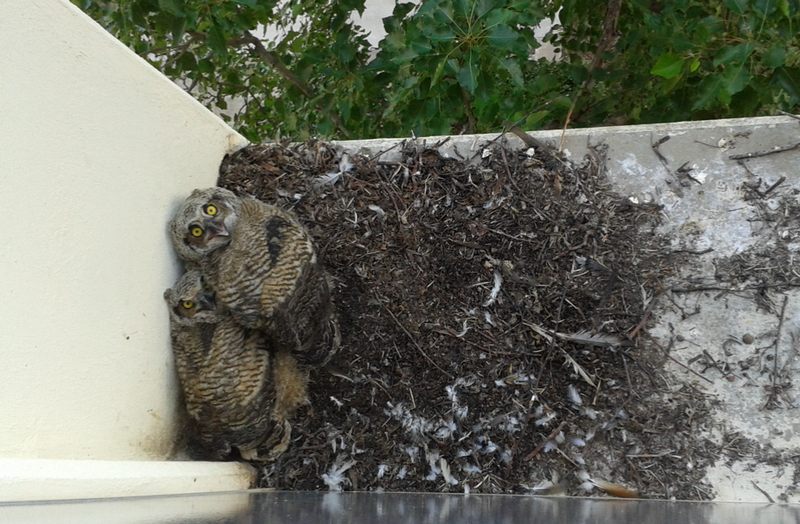 Owlets inching closer to fledging. Photo by Tieming Liu. Soon thereafter, the young left their nest. Owls routinely leave the nest well before – sometimes weeks before – they can fly. The young birds took up residence in the hedges nearby. 13 June 2014: It may look vulnerable on the ground, but this juvenile Great Horned Owl is right where it is supposed to be. Its mother is watching and it can defend itself pretty well at this stage. Unfortunately, people who encountered the owls assumed that they were injured or orphaned. 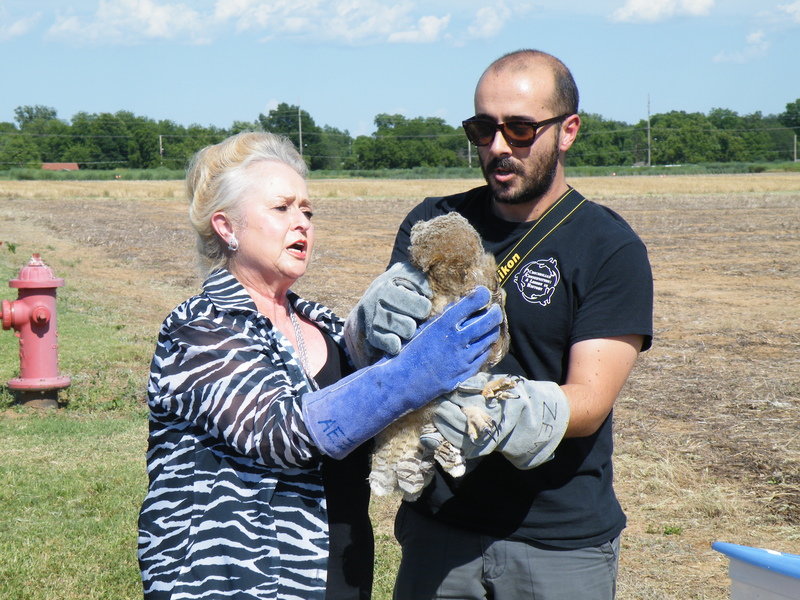 One of the youngsters was captured and brought to the OSU Center for Veterinary Health Sciences, and ultimately transferred to WildCare Oklahoma in Norman. Although the bird received excellent care from humans, it was needlessly separated from its family and its natal territory. Even many weeks after a young owl is capable of flight, parents provide food and other protection. 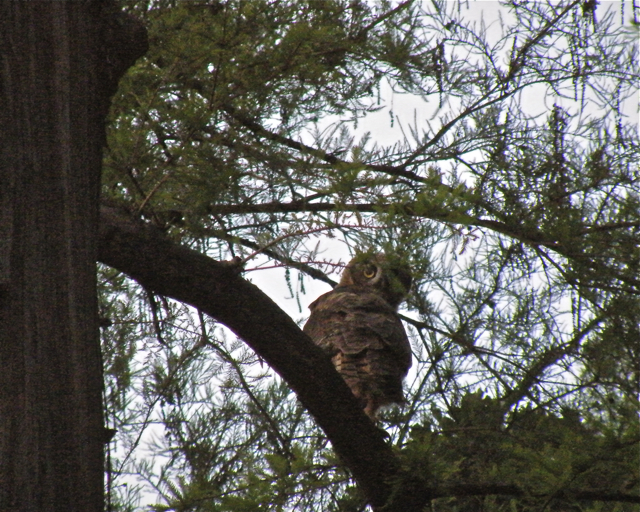 The second owl was last seen in a tree on June 15, and is presumed to have survived its post-fledging period. This year, 2015, the owls did not return to nest in their 2014 location, but they were back on campus and they started earlier (assuming, of course, that it’s the same nesting pair). 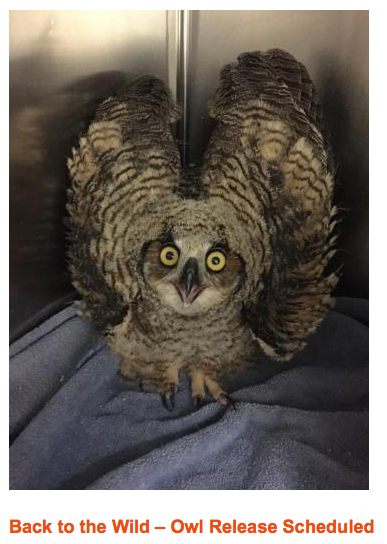 A fairly hefty young owl was brought to the OSU Veterinary Hospital on 6 May 2015. Apparently, the bird was collected from the ground somewhere near the Student Union; the original nest location remains unknown. Dr. João Brandao, Assistant Professor of Zoological Medicine, has overseen the care of this year’s owl, providing food, hydration, and the opportunity for her to develop flight muscles in a protected flight cage. The young owl is now ready to be released, and we are invited to witness this happy event. The Student Union’s juvenile owl, from 2015. She’s looking feisty! Please join us for the opportunity to celebrate a wildlife success story on June 10th, and spread the word to leave baby animals where they are – odds are they don’t need us at all. The National Audubon Society’s local representative asked John Couch and Helen Miller to organize a chapter of the NAS. The organization then became more formal with constitution and bylaws. Presidents were elected for 2-year terms. Here is a list of past presidents: Helen Miller, John Couch, Scott Shalaway, Billy Teels, Helen Jordan, Freddy Miller, Linda Bryant, John Dole, John Couch, Pat Jaynes, Jerry Wilhm, Susan Walker, Tim O’Connell. Many of these individuals served as president far longer than their proscribed two-year terms. Birders tend to be busy people; it is not always easy to find someone to take on the administrative responsibilities of president. Scott Shalaway was in the OSU Zoology Dept when he was president but left OK to live on a farm in W.VA, where he makes his living writing a nature column carried by a dozen or so newspapers, hosting a nature-oriented TV show and radio program, and, with a Canadian company, marketing high-quality wild bird food. Scott also found time to write and publish several natural history books. Billy Teels and John Dole have also gone to jobs outside of Stillwater. John Dole also published a book: Butterflies of Oklahoma, Kansas, and North Texas. Ann Redelfs began putting out a Chapter newsletter—Feathers. Subsequent editors included Carl Wisk, Susan Walker, Coetta Lamp, and a succession of paid individuals not associated with the Chapter. Susan Walker is again (since 2005) putting out Feathers and Pinfeathers. PCAS gave its first scholarship for bird research. PCAS began a savings account to accumulate money for a Nature Center. Mike Carter, an OSU graduate student and PCAS member, was given a scholarship to survey the birds of Payne County. His 3-year study resulted in the “Payne County Bird Checklist,” published by the Oklahoma Department of Wildlife Conservation. In 2008, 24 years later, Tim O’Connell, OSU professor, began the process of updating the checklist. Dolly Warden developed and published the first Pinfeathers page in Feathers. PCAS began to buy equipment for a future Nature Center. The first purchase was a “Spacemaster” spotting scope and tripod. Helen Jordan was nominated PCAS for an award as part of the national Take Pride in America Program—listing numerous community activities of the Chapter—and we won. Helen Jordan and Helen Miller attended an awards ceremony in the State Capitol Building and were given a certificate by then governor George Nigh. Cathy King was awarded a PCAS scholarship for work on “A Behavioral Study of Captive Maguari Storks in the U.S.” Cathy went on to do work in the international arena, married Koen Brouwer, a Dutch scientist working with storks, and now curates and does research at the Amsterdam Zoo in the Netherlands. The National Audubon Society awarded a framed certificate to PCAS member Elaine Stebler for having obtained the most sponsors and for raising the most funds in the West Central Region* during Birdathon that year. NAS presented PCAS with a framed certificate in appreciation of its having the largest number of Birdathon participants in the West Central Region. The ODWC awarded Rod Soper, an OSU Zoology graduate student a contract and $156 for the construction of 14 bluebird houses to be placed “in a segment of Highway 51 between Stillwater and I-35.” Rod had to monitor the trail during the breeding season for 5 years and then “his responsibility may be transferred to the Student Chapter of the Wildlife Society or other group with the Department’s approval.” Several different PCAS members, including Helen Miller, Kate Hellgren, and Olin Thomas have taken a turn at monitoring the trail since 1991 when Rod Soper relinquished responsibility. 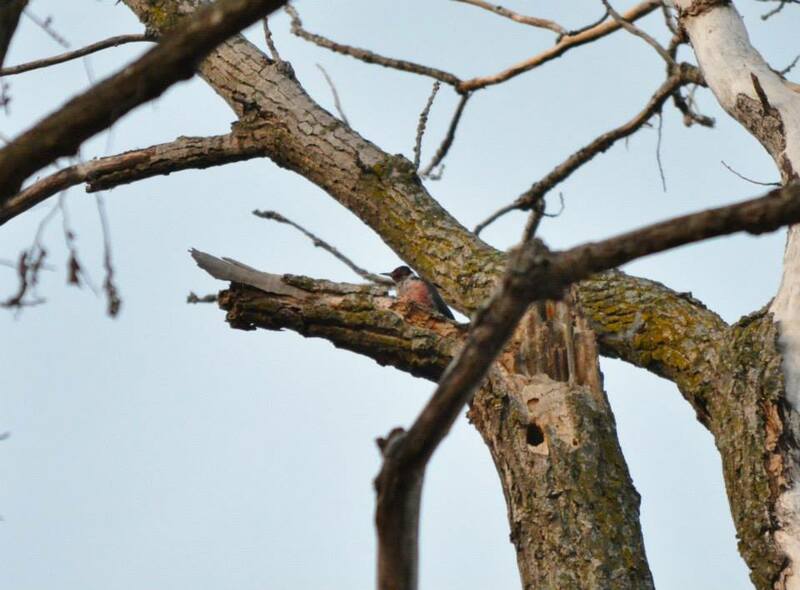 In 2007, a full 20 years later, OSU student, Hailey Deslauriers, took on the Bluebird Trail Monitoring responsibilities, followed by Jay Burtka in 2009. PCAS donated a number of bird and environmental children’s books and bird videos to the Stillwater Public Library. Under Elaine Stebler’s and Carolyn’s dual leadership, the amount of money the chapter raised won PCAS first place among chapters in the state and West Central Region, as well as second place in the nation for chapters of its size. Carolyn Hunger took over Birdathon and won the National Audubon Society’s William Dutcher Award for her work as a Birdathon fundraiser. Carolyn became a Birdathon ambassador for the NAS, making presentations to other chapters and at national and regional conferences. The PCAS participated in establishing Heinrich’s Park, in saving Gallagher Woods from development, in protecting the area north of Boomer Lake from development, in trying to get a prairie preserve established in Oklahoma, and in improving the natural areas at Sanborn Park and Lake McMurtry. Because a physical Nature Center was not possible at the time, Linda Bryant, then PCAS President, established Nature Camp and Nature Day, and the PCAS Board voted to hire Kate Hellgren to be our paid Nature Educator and the coordinator of these two programs. Kate’s commitment to the quality and integrity of PCAS programs was unparalleled, and her Nature Days and Nature Camps set the bar for the continued success of PCAS’s education efforts. Our participation in the Cornell University Great Backyard Bird Count increased significantly due to the encouragement of Pat Jaynes and the student counters pressed into service by Tim O’Connell. In four of those years, PCAS led the state in participation. Under Jerry Wilhm’s presidency, Susan Walker became editor-in-chief again of the PCAS newsletter, Feathers. Due to Susan’s publishing knowledge and today’s computer technology, the publication generated new and renewed interest in PCAS. The PCAS began to work with others in Oklahoma to establish an IBA (Important Bird Area). The Chapter received the first of two grants for Audubon Nature Camp from the Ligon family’s Delta Foundation. Birdathon began to return to the competitive and rewarding event that in the late ’80s and ’90s saw PCAS reach national acclaim. Five teams participated — Tim O’Connell’s Team Timmy’s Tyrannid Targeters sighting a record 131 species! Tim and his students have become a very important part of the Stillwater area bird census. Another ‘Thoner who deserves special recognition is Edwin Glover. Ed consistently raised the most funds year after year. In fact, Ed often raised more money than all the other participants combined. In 2007 Ed raised $2500 — a full $500 of that being his own generous contribution. Jim Ownby retired as website director and our .org site expired. Susan Walker created a new website and served as its webmistress until 2014. Over 400 people attended Nature Day, coordinated by Crystal Cork. Paul van Els, a graduate student from the Netherlands, Les Imboden, and Tim O’Connell instituted regular Saturday morning Nature Hikes in and about Stillwater. At the chapter’s opening picnic in September, Jerry Wilhm stepped down after three terms as PCAS president, and the new slate of officers for 2009-2010 was installed: Susan Walker, President; Freddy Miller, Vice president; Tim O’Connell, Secretary; and Les Imboden, Treasurer. In October PCAS went on an overnight camping field trip to the Great Salt Plains. In the spring PCAS members and friends went on an overnight field trip to Red Slough. PCAS increased Audubon Nature Camp to two, one-week sessions, each with 50 campers. spearhead our field trips for 2010-2011, and the Board as a whole decided to brainstorm and schedule our 2010-2011 programs. In October, Crystal Cork resigned from the Board and from her position as Nature Programs Director. A search committee, headed by Elaine Stebler, began the search for her replacement. In November we switched from a paper to an electronic newsletter and from a quarterly to a monthly. We put out our first e-Feathers and e-Pinfeathers. Our September opening meeting took place in room 119 of the Stillwater Public Library. The program was presented by Jen Grindstaff on Bluebirds. Participants enjoyed a potluck meal and after the program put together a bluebird house to take home. Lucy Walker was responsible for cutting the bluebird house kits and helping assemble them. A planned October overnight field trip to Cheyenne Bottoms was cancelled due to lack of interest. In February, PCAS hired Dani Thompson–an Ag Communications major at OSU–to be our new Nature Programs Director. She conducted two Audubon Nature Camps in June, with 40 campers in each. On February 27, PCAS held its first of what we hope will be an annual Audubon Garage Sale. We set up at the Expo Center’s Community Center on Friday and accepted donations from 4-8 pm that evening. We conducted the sale from 9-1 pm the next day. Response was good both in item donations and buyers. In September members voted in the new slate of board members: Tim O’Connell, president; Susan Walker, Vice President; Les Imboden, Treasurer, Jerry Wilhm, Secretary. Jim Ownby and Elaine Stebler stepped down fromthe board and three new directors joined the board: Jay Burtka, Damona Doye, and Andy Crosby. Tim O’Connell was elected president. Determined to return the PCAS to its birding roots and away from the fundraising that has been so much of its focus in the past few years, the Board voted to suspend Nature Day, Audubon Nature Camps, and the Audubon Garage Sale for the duration of his 2011-2012 term. The Board voted to rely on BIRDATHON to bring in the income the PCAS needs to fund scholarships and PCAS’s yearly operating expenses. PCAS program meetings were moved from the Stillwater Public Library to Ag Hall, Room 014, on campus. The SPL was charging $40 an hour and costing about $80 a meeting. Under Tim O’Connell‘s leadership, PCAS conducted its first Birdathon Big Day, fielding 14 teams of students who rallied at Tim’s house afterward for a cookout and to tally their sightings. When Birdathon Big Day fundraisers were added to traditional Birdathon fundraisers, we managed to field 19 teams this year — as opposed to 4 the previous year. Birdathon raised $5441.45. Longtime Stillwater resident and Payne County Audubon member, Florence Wass, died July 30th. She was 96. Her son, Mike Wass, asked that donations be sent to PCAS in lieu of flowers. Susan Walker and Tim O’Connell switched executive board positions, Susan moving into the presidency for a second term and Tim moving to the vice-president’s position. Plans were set to present Sutton Avian Research Center’s It’s All about Birds to Stillwater and area 6th graders. The program took place on October 10, 11 in the H.S. Performing Arts Center with overflow seats going to Audubon members and community members. It was a big success and will come to Stillwater every two years. The board voted to resurrect Audubon Nature Day. Les Imboden and Crystal Cork were elected to chair/coordinate A.N.D., however, illness caused it to be cancelled until October 2014. The board voted to again rent room 119 at the Stillwater Public Library for PCAS monthly programs. John Polo led a fall overnight field trip to Black Mesa, OK, and Susan Walker led a spring field trip to Quivira and Cheyenne Bottoms National Wildlife Refuges, KS. Susan Walker coordinated the PCAS’s first (annual we hope) Bird Photo Contest. Distinguished judges included, wildlife photographer Tom Ulrich, photographer and Tulsa Audubon president, John Kennington, and local photographer, Ken Helt. Tom Ulrich conducted a Half Day Digital Camera Workshop and split the proceeds with the PCAS. PCAS applied for and received an $800 grant from the Norcross Foundation and purchased a computer projector. The board voted to award two scholarships in addition to the two $1000 scholarships it awards to OSU students: $1500 to a Payne County school teacher to enable him/her to attend National Audubon’s Educator’s Week, Hog Island, ME; and the other $500 to enable a Payne County student and guardian to attend the Woodward Lesser Prairie-Chicken Festival. OK Audubon Council met in Stillwater for its winter meeting. Discussion revolved around having a National Audubon Office in OK.
On February 22, the PCAS hosted an Optics Workshop at the Stillwater Agri-Center. Cory Suddarth of Henryetta, OK, cleaned binoculars and scopes for free and the Mill sold black-oil birdseed at a 10% discount. The board again voted to resurrect Nature Day in October but when they learned that it would require $2000 to put on again decided not to. Susan Walker again coordinated the 2n Annual PCAS OK Bird Photo Contest. Winners’ photos were again showcased in a desk calendar produced by Yearbox of San Jose, California. The PCAS hired Nicole Sutton of the OSU Riata Business School to complete a business plan for a future PCAS Nature Center. Leslie Miller is coordinating the Nature Center investigation and also serving as Nicole’s supervisor. In October 2014 Susan Walker resigned her administrative and editorial positions: PCAS Presidency, Feathers & Pinfeathers editor; Webmistress. Tim O’Connell again stepped into the President’s seat. Where can I find a copy of the Payne County Bird Checklist? My daughter picked up a copy recently at the wildlife expo, but I would love to distribute copies to our homeschool group. Thank you!